Hey everyone, before your regularly scheduled broadcast I just wanted to say I really appreciate all the love I’ve been getting about this blog since I started it. I said at the outset that this was mostly for my own personal interest and that’s still true, but it means a lot to get affirmation about stuff I find interesting, and more importantly, about stuff I’ve put a fair bit of work into. That goes a long way in keeping me pumped about doing this, so thank you. Also, I’ve got a favour to ask. I’m usually not one to really push things in public forums, but it would be awesome if you either a) told a friend to read this blog or b) posted it on whatever social media you use if that’s your scene, or c) both of the above. Now that I know there are nibbles of interest, I’d love to spread the net a bit. No pressure, but if you like what you read and want to help me out, just give me a quick shout out. Maybe pick your favourite post so far and send it to someone, or bring it up at the dinner table. Those are just a few ideas, I got plenty more. Shout it from the CN tower, for example. Or write it on a jersey and throw it onto the ice at a Leafs game. Or put on a vest and talk to people walking down the street. Or write a song and busk about it in the subway. Okay, I’m done. Thanks again, now onto the show. The Toronto islands are a pretty great not-so-hidden gem of the city. It’s the perfect version of an urban park excursion that is much removed from the concrete of downtown, and there are some pretty spectacular views of the skyline. Sure, getting on that ferry in the summer is a bit loco, and you may start to wonder if it’s really worth sardining it for a whole Saturday, but as soon as the ferrie empties island-side and people begin to spread out, you realize there’s tons of room for everyone, and it’s so walkable and picnicable. I realize I’m sounding a bit like a tourist pamphlet, but this is to say that what is now a rather charming City park has been through some serious changes over the past couple hundred years. In getting my feet wet in the history of these islands, I began to realize how much there is to explore and how many research rabbit holes I could go down for this topic, so don’t be surprised if this is just the beginning of my Toronto islands suite. For now, I want to talk about the oldest stone structure built in Toronto, the Gibraltar Point light house. The Toronto Harbour in 1792. I have to confess, I always expect to see leviathan scales coming out of bodies of water on maps this old. 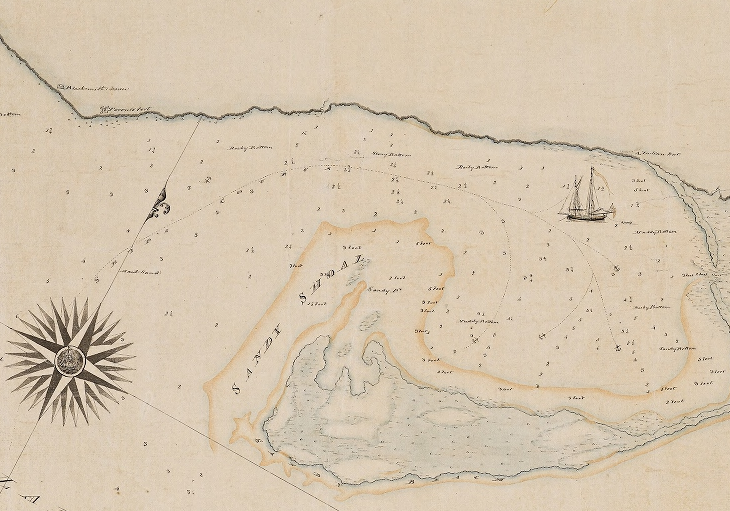 The islands were still a peninsula at that point, and the surveyors didn’t view the land as much more than a sand bar. That being said, Simcoe talked about plans to build a lighthouse really early in the game. There is some confusion over the terms here, because they named the northern most tip of the island Gibraltar Point (apparently because its strategic value was comparable to this Gibraltar, which…is a little bit of a grandiose claim, I gotta say), and the lighthouse was called the Gibraltar Point lighthouse, even though it was built on the southwest part of the island, facing out into the lake. Perhaps the whole Western end of the peninsula was Gibraltar Point. Either way, it was very useful to have this lighthouse built ASAP, to make sure ships were able to safely see the peninsula and guide themselves into the harbour. It was proposed in 1803 and built by 1808, becoming the first stone building in York. The stone was shipped over from both Queenston and Kingston (there’s a royalty pun here somewhere, I know it), and the walls were six feet thick at the base. It was first built at 70 feet tall, and increased to 82 feet when they refurbished it in 1832. If you really want a sense of how long ago 1808 was, consider the fact that they used sperm whale oil until 1832 when they made the switch to the new up and coming source of cutting edge energy supply….coal. Apparently the light house used 200 gallons of coal oil every year. This is a painting from 1820 by Robert Irvine. They used to put up a flag to signal to the mainland harbour when a new ship was coming in. Represent Upper Canadaaaaa. Courtesy of the Toronto Public Library. The lighthouse also gave rise to the first residents of the islands: The lighthouse keepers (there’s the potential for a young adult fiction series here, I know it). In the above picture you can see that there’s a small house for the keeper and his family to the left of that lighthouse. According to our friend John Ross Robertson, “The duties of these men are not heavy, and save and except the duty of lighting the lantern at sundown and extinguishing it at sunrise.” Sounds like a pretty good gig. Well…not for all of the keepers. J.P. Radan Muller (who I also saw as just “J.P. Muller” or “J.P. Radelmuller”) was the first lighthouse keeper, and he died a mysterious death after 7 years on the job. 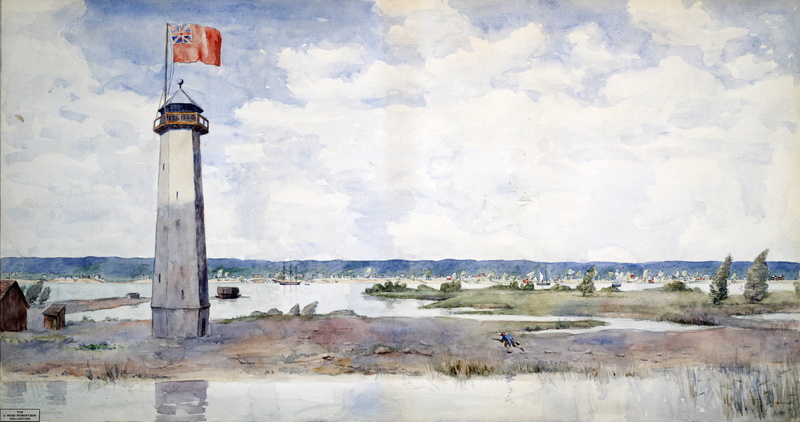 The story goes that there was a blockhouse on Gibraltar Point that held a couple cannons and a small group of soldiers, and those soldiers often visited the lighthouse keeper. In January of 1815, apparently some soldiers went over to see J.P. to get some beer from him, then they got mad when he refused to give them any. There are varying accounts saying that the soldiers had already had a bunch to drink and Muller wanted to save the little that was left in his keg for himself, or that he was just being miserly and refused them outright. Either way, allegedly they got mighty mad, mini mob mentality set in, and they murdered him and buried his body nearby. None of that was ever confirmed, but the story continued to be passed down among the island folk for generations as a kind of ghost story, with claims abounding that Muller still haunted the lighthouse grounds. Four generations of lighthouse keepers later, George Durnan went looking for Muller’s body and did in fact unearth what he claimed were bits of a coffin and jawbone. Jury’s still out though. 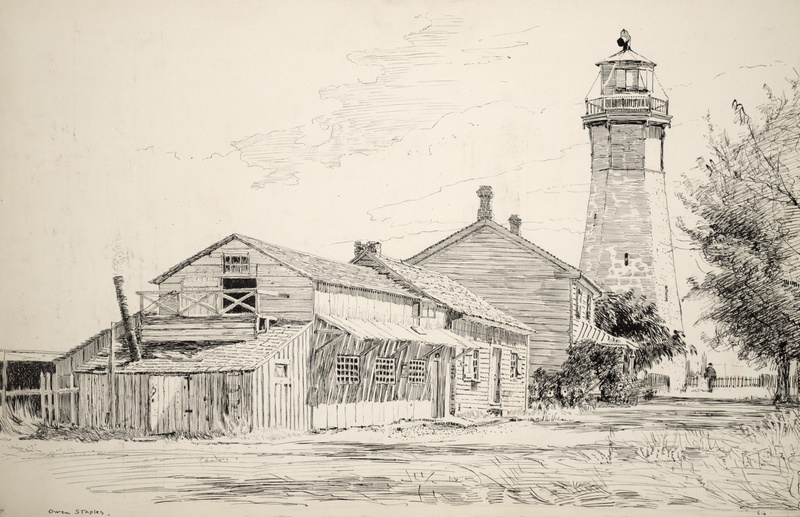 The lighthouse and lighthouse keeper’s house in 1894. Looks cozy and haunted, eh? Courtesy of the Toronto Public Library. George Durnan actually holds the record as the longest serving Gibraltar Point Lighthouse keeper all time, reigning from 1853 to 1908. Lots of changes happened during his regime too. In 1878, they rebuilt the top of the lighthouse and changed the mechanism so that the light revolved around, and Durnan had to rewind the thing every two days. I know this is probably terribly innaccurate, but I’m picturing one of those giant handwheel valves. So…that sounds heavy duty. 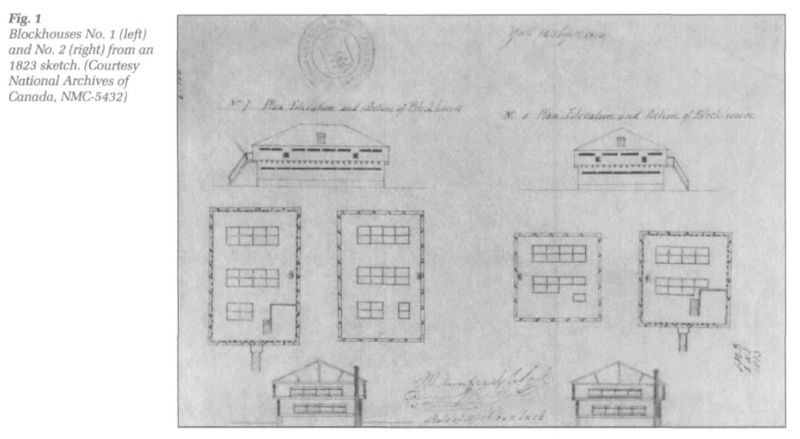 The tiny population had increased during the late 1800s, and starting in the 1890s Durnan also doubled as caretaker of the new schoolhouse. 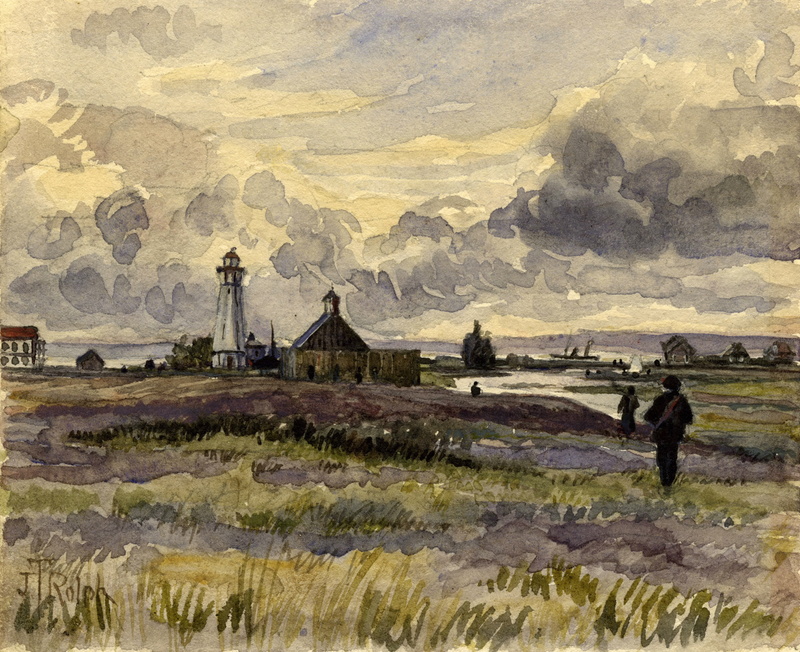 This is from 1890 – The lighthouse with the one room school house beside it. Oh, and some crazy Mordor clouds. Courtesy of the Toronto Public Library. 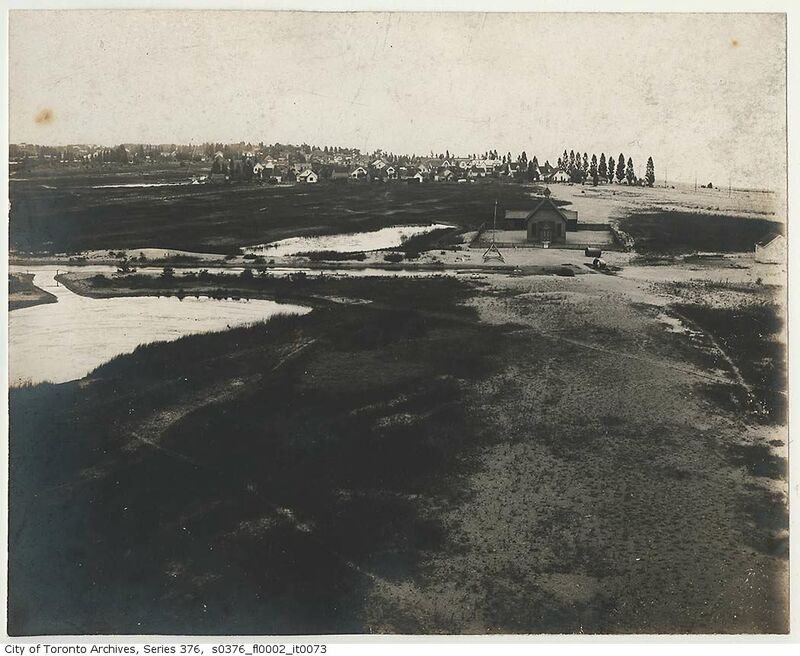 Here’s an actual picture taken from the lighthouse, facing the school in 1899. Courtesy of the Toronto Public Library. Over time, the lighthouse became less and less important to the functioning of ships in the harbour. In 1907 the light almost got shut off permanently by the government, as they claimed it was an “unnecessary expense” and that the lights of Toronto itself were bright enough to guide ships coming in. There were a number of petitions in opposition and the light stayed shining, but it’s usefulness was waning quickly. The light was finally extinguished by the last lighthouse keeper, Debie Dodds, in 1957. After a few years it was sold to the city and in the late 1960s it was restored to its current state. 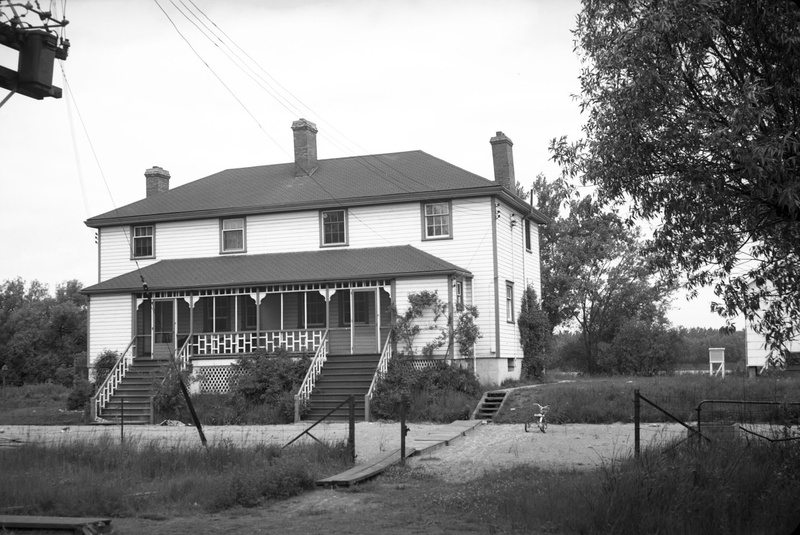 The lighthouse keeper’s house as it was in 1954. Bit of an upgrade from the first model. Courtesy of the Toronto Public Library. 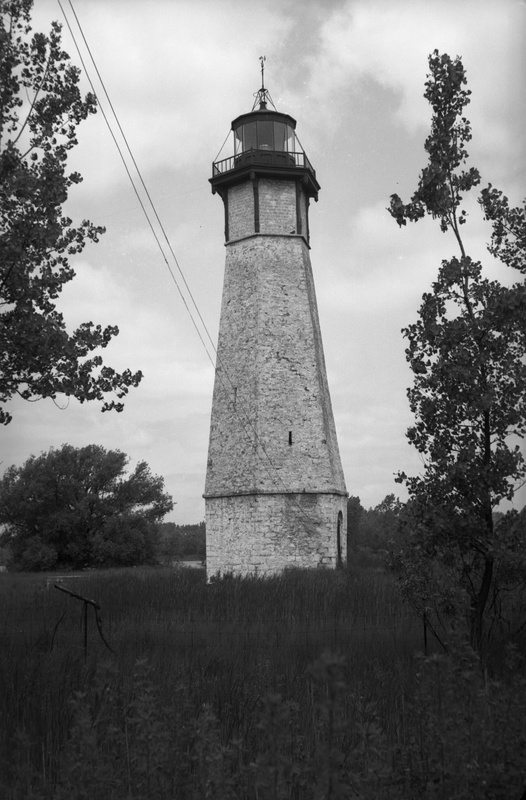 The lighthouse in 1954. It ain’t lightin’ much any more. Courtesy of the Toronto Public Library. While its most colourful past happened in the 19th century, this lighthouse is still standing strong. If you’re curious, here are some current pictures to tide you over until you check it out. When you do go, you’ll see a little path jut off the main pedestrian path and head over to this lighthouse, which is now in a small clearing and shrouded by trees. It looks almost decorative given it’s so far past its usefulness. It’s kind of in an awkward spot now, and apart from a couple plaques, there’s not really much to see. So when you’re there, try imagining this place as it was; a puddled sandbar jutting out from a forested shore, and this one building sticking up from it, shining sperm whale-oil flame, the lone light in what is now a very golden horseshoe.